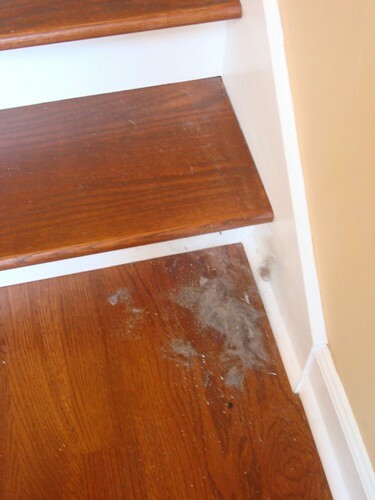 Before moving into this house, I never truly grasped what exactly "dust bunnies" were. Whenever I had pets, I had carpet. And the one previous time I had lived somewhere with hardwood floors, we had had no pets. So it was a bit of a surprise when we moved into this house to learn exactly how much fur had been getting ground into the carpet in the rental. This is just what I swept off of the stairs this morning. Just. Off. The. Stairs. No wonder the cats need so much food. They are creating dust bunny colonies to take over the house. God I hate carpet, so gross. Our next house will have tile and stained concrete if I have anything to do with it (and I do)!! I had the same eureeka moment regarding dust bunnies when we moved into our current place. All laminate flooring and I have to swiffer under the bookcases now. I got some reusable swiffer wipes from QuiltingMama on Etsy (my review) and invested in the swiffer dry broom to make it easier. I totally understand. We have dust bunnies like no other. I swear, I vacuum and sweep, 2 minutes later they reappear. They multiple like... well... bunnies.